To take advantage of the Indians’ versatility Warner drew up a new offense. 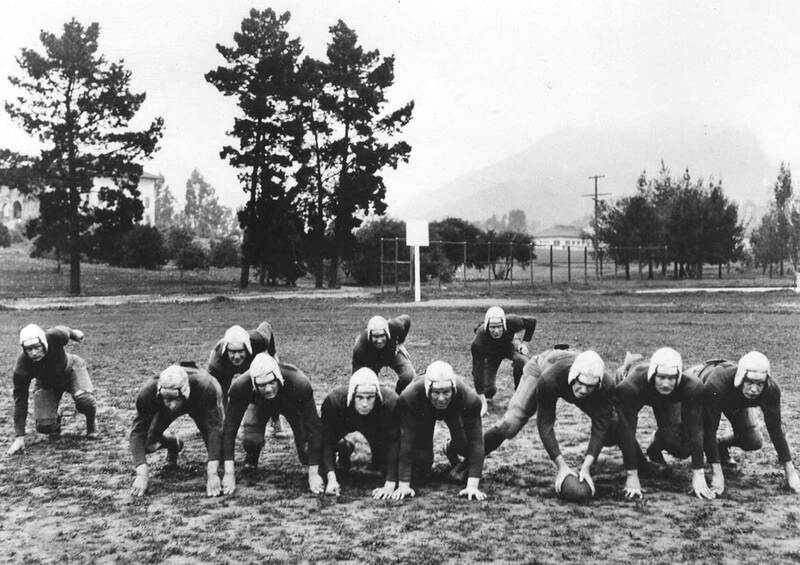 Camp would dub it “the Carlisle formation,” but later it would be known as the single wing. It was predicated on one small move: Warner shifted a halfback out wide, to outflank the opposing tackle, forming something that looked like a wing. It opened up a world of possibilities. The Indians could line up as if to punt — and then throw. No one would know whether they were going to run, pass or kick. For added measure Warner taught his quarterbacks to sprint out a few yards to their left or their right, buying more time to throw. The rest of the players flooded downfield and knocked down any opponent who might be able to intercept or bat away the pass. “How the Indians did take to it!” Warner remembered. “Light on their feet as professional dancers, and every one amazingly skillful with his hands, the redskins pirouetted in and out until the receiver was well down the field, and then they shot the ball like a bullet.” Carlisle roared off to a 6-0 start. On Oct. 26 they went to Philadelphia to face unbeaten Penn, ranked fourth in the nation, before a crowd of 22,800. No team all season had crossed the Quakers’ goal line. But on just the second play of the game Hauser whipped a 40-yard pass over the middle that William Gardner caught on a dead run to set up a touchdown. 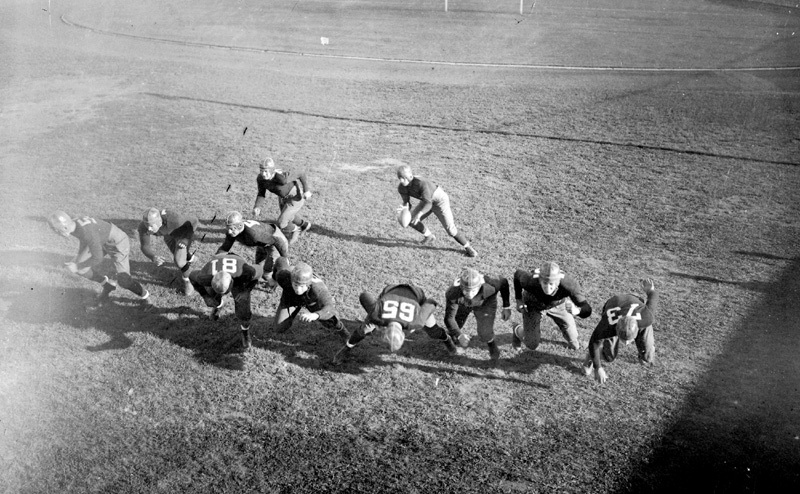 Hashmarks were closer to the sidelines in the 20s and 30s than they are today, so offenses favored running to the wide side of the field. As a result, formations were routinely unbalanced to that side which created a pronounced strongside. This was particularly true in the fledgling NFL, where power running was the principal method of moving the chains and, when it came to power, the Single Wing ruled. So did the Notre Dame Box. The Single Wing, as seen here in this video, is the basis for the modern Wildcat and all it’s variations. Even Don Markham’s Double Wing has its roots in the Pop Warner system. Here in the video, the Single Wing is mixed in with a little Notre Dame Box which started out looking like the “T” Formation — back then it was called the “Regular” Formation — then shifted into various overloaded sets that created leverage and confusion. Check it out. If you’re lucky enough to have a long-snapper or can develop one — probably two — then the Single Wing is a simple system to teach and powerful in its execution. The 2009 season brought a new coaching opportunity for me. Previously I was coaching Junior Pee Wee level football in a local Pop Warner organization. In 2009 our town wanted to reboot their youth tackle program which included the 5th and 6th grades. My son was a 5th grader in the district so I took one of the 5th grade head coaching positions. There were three 5th grade teams and two 6th grade teams that played games against outside competition. Each team played a six game schedule but we were not members of a league so we played an independent schedule against teams that had open dates in their schedules. This is was quite a challenge because just about every game we played with different rules. In addition 5 of our 6 games were versus 5th and 6th grade combination teams.